Chimé Pakmé Nyingtik (Tib. འཆི་མེད་འཕགས་མའི་སྙིང་ཐིག་, Wyl. ‘chi med ‘phags ma'i snying thig; Eng. 'The Heart Essence of the Sublime Lady of Immortality') is a long life practice discovered as mind terma by Jamyang Khyentsé Wangpo in 1855. 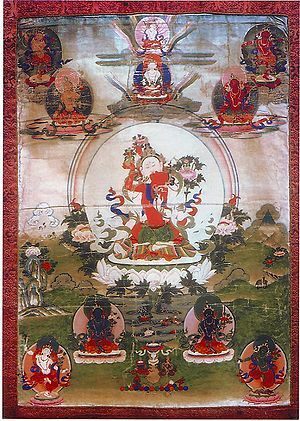 It features a mandala of White Tara (in the form of White Tara Wishfulfilling Wheel) in union with the Lord of the Dance. Jamyang Khyentse revealed the terma of Chimé Pakmé Nyingtik at his seat Dzongsar Tashi Lhatse in a vision of the three masters who attained the level of vidyadhara with power over life: Guru Rinpoche, Vimalamitra and Shri Singha. Through its power and blessings, many masters, including the great Jamgön Kongtrul, have been able to remove obstacles. In fact, according to prophecies, the life of Jamgön Kongtrul would have had many obstacles, and he would not have lived very long, but for this practice of Chimé Pakmé Nyingtik. The highly respected master Jamyang Khyentsé Chökyi Lodrö, in his biography, said that he received this transmission about ten times, and held this as his most important practice. It was also the main heart practice of Dilgo Khyentse Rinpoche, who completed all the required practices seven times in retreat. More recently, one of the main holders of this practice was Kyabjé Trulshik Rinpoche, who every year spent at least a month in retreat practising Chimé Pakmé Nyingtik at Maratika cave in Nepal, the place where Guru Rinpoche accomplished the level of a vidyadhara with power over life. Khyentse Yangsi Rinpoche, Lerab Ling & world-wide streaming, 10 July 2014; permission-blessing empowerment from the brief version of Chimé Pakmé Nyingtik. ↑ According to Orgyen Tobgyal Rinpoche, he gave the rtsa ba'i smin byed bklag chog tu bkod pa ye shes bdud rtsi'i chu rgyun, which, until Neten Chokling gave it in 2013, was the only time the elaborate root empowerment had been given in Lerab Ling. This page was last edited on 23 August 2016, at 10:03.